We love hearing about our client experiences, both good and letting us know where we can improve. Please read what some of our clients have said about us. Very satisfied, but you have to be patient. 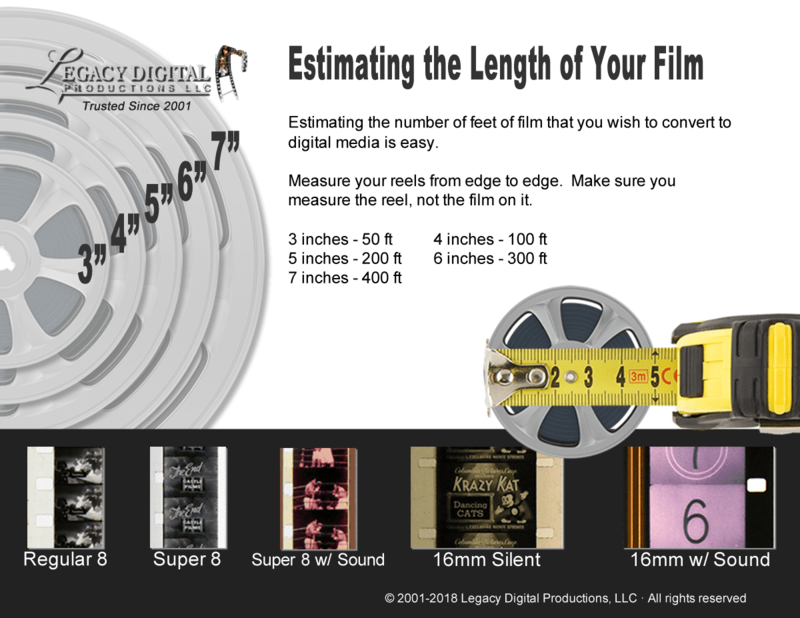 I had 1700 feet of old (1950 - 70's) 8mm and Super8 film digitized. Converted to both SD and HD formats onto a disk drive that I supplied, so files are quite large (20GB for 8" reel - 400'). But the higher resolution (than DVD using mpg2 compression) is better for my purpose of video editing. HD is 1920x1080, but of course the image is still the original 4 x 3 aspect ratio (which makes the picture part 1440 x 1080) so as expected there are black bars on either side -- but resolution is as good or better than the film (some sites estimate 8mm film resolution to be around 800 by 600). It took about 7 weeks (they said 6 to 8 weeks), so be prepared to deal with that turn-around time. But quality was supurb -- with the knowledge that filmstock does degrade/fade over the years. But the video files that they produced was what was on the film, and in fact is _better_ than what I'd seen before with a projector, because now the lighting is consistent and doesn't fade or blur towards the corners. I received some old 16mm films from my brother in law, that belonged to his Dad, and they were stored in the garage, some of them outside of a film can, some dusty and dirty. They are old WWII news reals, and other films. 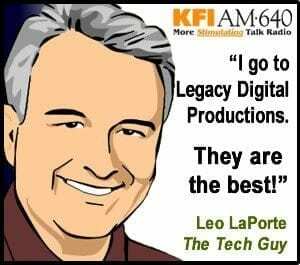 The edges were curing, and some of them smelled like vinegar, and I wasn't sure if they would be able to be transferred, so I called Scott at Legacy Digital to come take a look and see what he could do. I am extremely happy with the work that was done, and I wouldn't go anywhere else. They come and pick up the files, and then deliver them, so you don't have to worry about them getting lost in the mail, and the quality is amazing. I requested 1080P frame by frame scans with a digital copy saved on an external hard disk. I enjoyed my converstion with Carter today at the Carlsbad Village Faire. I told him how pleased I was with your work for me on the 16mm film conversion and the slide conversion. Any people passing by at the time I was near your booth, I extolled the excellence of your service. Any time I ever get the opportunity to do so, I always highly recommend your company. It is always a pleasure to be able to honestly recommend products or services which I have found to be truly excellent. Not only did you do a fabulous job, working with you made the whole process enjoyable. Picking up my films and also personally delivering them helped me feel safe about letting them out of my sight. I was deeply touched. I consider these memories priceless. I was especially grateful for the "extra" mile you and your group went to to assure our discs were top notch. I'd be pleased to recommend you to anyone I come across for whom this kind of production work would be indicated. All in all I'm pleased with the result and the professional treatment we got while at your studio. Thanks to all who we re-involved. Feel free to quote me. My Grandparents had 8mm films that I had transfered to dvd. Scott came to my home and explained in detail the process. When completed, he actually came to my job to deliver. I was surprised what a great job they did. So after some tears and laughs seeing 50 years of film, I have something to share with my children and grandchildren. I would and have reccomended to everyone, worth every penny. Legacy Digital did a fabulous job of getting our old family films and slides on dvd for my parents' anniversary. The quality was amazing and my parents were so surprised. Scott was so helpful picking up and delivering our order saving us time and gas money and keeping our family treasures safe from the mail. I definitely would recommend them to anyone and in fact am calling them again to do all of our vhs tapes and camcorder tapes next.